All women need to know how to prepare for the mammograms they will eventually need. When you get your first mammogram is determined by your age and other risk factors, but all women should have this breast cancer screening in their lives. Don’t be afraid of a mammogram. If you know what will happen and how to get yourself ready for the procedure, your fears will ease. It’s normal to feel anxious, but there’s no need to be so afraid that you put off the process. A mammogram could save your life. Discover what you need to know whether you’re getting tips for your first mammogram or you’re a veteran of the process. Mammograms are x-rays of breast tissue. Your doctor will use the images from the procedure in one of two ways, for screening or diagnostic purposes. When you have the imaging will depend on which of these reasons your doctor needs the images for. Screening: Screenings are used to look for early signs of breast cancer before physical symptoms, like the appearance of lumps. Sometimes, a doctor will use the first screening as a baseline to compare future images to. Diagnostic: When your doctor uses your mammogram for diagnostic purposes, you or your doctor has found something of concern during a physical breast exam. The diagnostic image gives the doctor a clear picture of what lies under the physical abnormality. When getting mammograms, the American Cancer Society suggests using the same imaging facility every time. Staying consistent with the imaging center you visit makes it easier for the radiologist to compare your results to prior images. Because all women have varying densities in their breast tissue, comparing new and future images to older ones will make it easier to see changes in your breast that could indicate a problem. Because using the same facility for all your breast imaging procedures is so important, you will want to find one you feel at ease with. Look for a center that makes patients feel comfortable and cared for while providing accurate results. Such a center will be one you can rely on for the decades you’ll need to return for your ongoing breast health care needs. Should You Have a Mammogram? The answer to whether you should have a mammogram is yes. Whether you have implants, small breasts or are post-menopausal, you need a mammogram. The exact time when you have your first procedure will depend on how many risk factors you have. The more risk factors, the more imperative you have early mammograms. But all women will eventually need to have the procedure regularly. Your doctor will help you to choose the best time to get your first mammogram. Your physician’s recommendation on the timing will come from your medical history and information about your family. If you have a sister or mother who has had breast cancer, you could be at a higher risk and need earlier screenings. When Should You Start If You Don’t Have Risk Factors? Women without risk factors should start screening between 45 and 50. The American Cancer Society suggests starting screening at 45 and getting annual mammograms for the first ten years with biennial exams after that. The U.S. Preventative Services Taskforce recommends beginning the mammogram process at 50 and having screenings every two years for the next 24 years. Get your doctor’s suggestions about your situation. Your doctor will be more familiar with your health and risk factors to decide if you need earlier screening or can wait until later. When Should You Get a Screening If You Are at High Risk for Breast Cancer? High-risk people include those with a near relative who has had breast cancer, have the BRCA gene mutation, had chest radiation therapy or have had breast cancer before. Ask your doctor if you’re not sure of your breast cancer risk level. Those with risk factors could start mammograms before age 30. Your doctor may also suggest combining mammograms with MRIs or other screening tools for the most accurate results. There are several things you can do to ready yourself for your screening. Educate yourself: Learn all you can about what happens during and after the mammogram procedure. The more you know about what will happen and what the results mean, the less frightening the screening will be. Choose a Facility: The screening facility you select needs to help with your insurance, provide accurate results and treat you well. We do all three and more at Envision Radiology. Schedule at the right time: When you schedule your screening will determine the amount of discomfort you have. Your breasts change in density and sensitivity throughout the month due to hormonal changes. Ideally, you should have your mammogram a week after your period, which is when your breasts will feel the least sensitive to pressure. Wear separates: Don’t choose a one-piece dress or romper for the day of your screening. You’ll need to take off your top and bra. You’ll be given a cover to keep you warm after you undress. It will be easier for you to ready yourself if you have an easy-to-remove top and bra. Skip deodorant: Using deodorant, lotion, antiperspirant, cream or powder under your arms could interfere with the screening results, producing false positives. Wait until after you have the screening to put on your deodorant. Bring prior mammograms: If you have had mammograms at another facility, request the results be sent to where you will have your next screening. Bring the images with you if you have a digital copy of them on a disc. In some cases, the radiologist only needs you to sign a release form to have these images sent. Ask questions: If you have any questions about the procedure or what is happening, ask the technician. 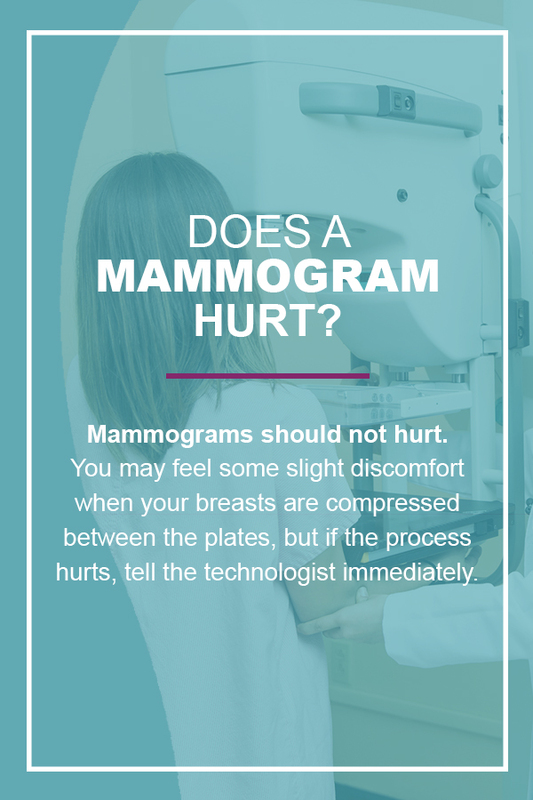 While the technician doing the mammogram won’t be able to discuss the results with you, they can tell you about the process. Also, if you feel scared or in pain, talk to the technician. You may feel discomfort, but a mammogram should not feel painful. Relax: After the procedure, you will get the results from either the screening facility or your doctor. If you have any concerns about what the mammogram revealed, communicate those concerns to your doctor. If you need to take additional steps, your doctor will let you know what to do. When it’s time for your appointment, you’ll be taken to a dressing area where you’ll be asked to remove any jewelry, clothing and undergarments from the waist up and put on the drape. The technician will call you to the screening area after you’re ready. You will be the only one in the screening area along with the technician. Screening facilities use extreme care when protecting their patient’s privacy. During the procedure, you will have each breast individually placed onto a plate. A second plate will press down on the top of your breast to flatten it out. Flattening out your breasts produces a more precise image and requires less radiation. The technician will take at least two x-rays of each breast, but you may need more if you have implants or larger breasts. After the technician has checked that the x-rays of your breasts are clear enough for the radiologist to interpret, you will be able to put your clothes back on and leave. Your doctor should contact you about the results in a few days. Mammograms should not hurt. You may feel some slight discomfort when your breasts are compressed between the plates, but if the process hurts, tell the technician immediately. They can make changes to make it more comfortable for you without sacrificing the x-ray quality. If you have your mammogram during your period or the week before, when your breasts feel more sensitive, the procedure will be more uncomfortable. Some women’s breasts swell the week before and the week of their periods. This condition could make it harder for the technician to get precise results. Talk to your doctor about when to schedule your mammogram if you have irregular periods or extremely painful breast swelling and tenderness. From start to finish, the mammogram will only last 20 to 30 minutes. The actual time of discomfort when your breasts are compressed for the x-rays takes just a few seconds, long enough to capture the x-ray image. Most of the time spent will be the technician positioning you to get the most precise image and ensure your comfort. Radiation exposure: Like other x-rays, you will get a small amount of radiation exposure during the mammogram. The dose is so tiny, however, that it is unlikely to cause problems. False positive: While no one wants to hear about a positive result on her mammogram, a false positive can be as bad. Because false results happen sometimes, doctors typically recommend additional screening if your mammogram came back with an abnormal result. These other tests are to determine the accuracy of the original results. Don’t feel bad if you need extra tests. About 10 percent of women get a call from their doctor for additional exams after a mammogram. Some cancers can be missed: As good as mammograms are for detecting breast cancer early, one in five women with cancer will have normal mammograms. These cancers may be difficult for the radiologist to see or too small to be visible on the image. The tendency for false negative results reinforces the need for regular mammograms and the importance of all women’s health exams. After the exam, a radiologist will look over your results. They may need to compare the images to images from prior screenings you’ve had. At Envision Radiology, we send the results to your physician within hours of the imaging. Your doctor will reach out to you with the results within ten business days. Call the office if you have not heard any news by then. If your results could indicate you have cancer, our facility — like all other imaging centers — is required to send you a summary in layman’s terms of your results. If you had any abnormalities, your doctor will discuss your next steps. You may need other imaging tests or a biopsy to test for cancer. But don’t be afraid because you had abnormal results. Extra tests will verify if you have cancer or not. Some findings could be benign conditions. Always follow up with your doctor over any concerns you have about your results. The results of the screening are given on a scale of zero to six. Each level corresponds to the action you should take after the procedure. Zero: A score of zero means the images captured were not able to be interpreted. You will need additional screening. One: Low scores correspond to fewer abnormalities. A score of one, or negative, means your breasts appear normal with no apparent problems. Two: If you have a score of two, the radiologist found an abnormality, but the mass was benign, not cancerous. This rating is considered a negative result. Three: With a score of three, the radiologist found something that has a 98 percent chance of being non-cancerous, but to be sure it is not malignant, you will need screenings twice a year for the next two years to ensure the area does not change. Four: A score of four indicates the radiologist recommends a biopsy to see if the mass is cancerous or not. Generally, the radiologist is only mildly to moderately sure of cancer in this instance. Five: Scores of five indicate a 95 percent or higher chance of a cancerous area. Your doctor will discuss a biopsy to take a sample of the tissue to look for malignant cells to verify the presence of cancer. Six: If you get a score of six, you already know you have cancer and are in treatment. Mammograms with this score typically are used to see the effectiveness of the treatment. This score is only given to those who have had a mass verified to be cancerous from a biopsy. Don’t put off caring for your health. If your doctor suggests that you consider getting a mammogram, schedule one today. Do not let your fears make you put off breast cancer screenings through mammograms. Even if the results indicate cancer, the earlier your doctor spots it, the more likely treatment will be successful. To help you feel more secure about the procedure and results, contact us at your nearest Envision Radiology location. We have several sites around the country equipped with the latest in mammography technology. You also won’t have to wait weeks to get results. Our centers send results to your referring doctor typically within four business hours of the procedure, making it the fastest in the industry. We care about our patients and respect both them and their time. If your doctor has suggested that you get a mammogram, take charge of your health and sign up for one today. Your health is essential, and at Envision Radiology, we want to be part of your journey in caring for your health. We will help with your mammograms by giving you accurate, fast results while treating you with the care and respect you deserve.